Love the game, thanks for making it. Where might I find an instruction guide or FAQ, etc. For instance, I've forgotten what I need to do to level up. At the moment, I'm hanging out in Roscoe's with 100+/13 experience points for my next level. Last edited by thebruce on July 28th, 2017, 7:25 pm, edited 1 time in total. Figured it out. You look at the 'gem' on the back of your right hand and grip it with your left hand. An easy to find faq or reminder for this stuff (e.g. hold hands above head to return to home base) would be very helpful. I was surprised that this section of the forum didn't open with a different theme to it; different from the Bard's Tale. *I use a "Stylish" fix for this myself. 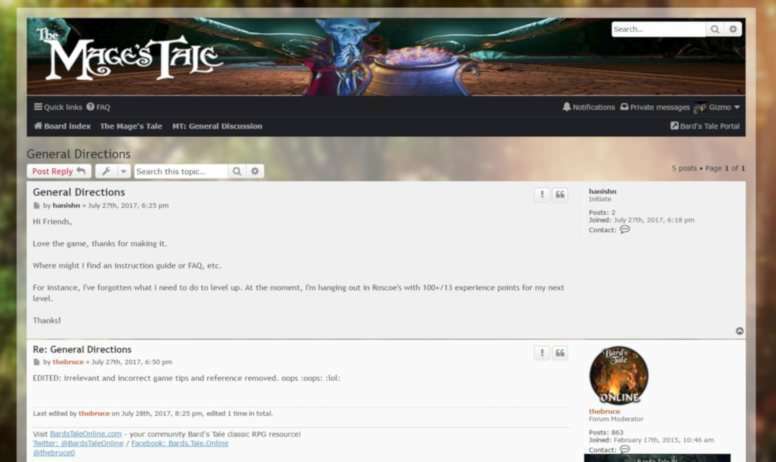 That way I don't mistake the Mage's Tale forums for the Bard's Tale ones. I use a bookmark to view new posts in both forums. I need to build muscle memory to check the forum name since all the threads are mingled together in the list. Same here... (and in other forums). That's why it's so easy to mistake what thread the post is in... and because of Identical themes in different sections. Figured it out. You look at the 'gem' on the back of your right hand and grip it with your left hand. All I've done is bring the tip of the index finger from my other hand into contact with the pulsing "Level Up" star above the level status gem, and maintain contact for a few seconds, and the level-up is triggered. Last edited by ploog on August 13th, 2017, 1:12 pm, edited 1 time in total. The game (Mage's Tale) appears to highlight a stargate location's glyph background gold when you've found all the items within the level (i.e. once the map's thoroughly completed). Well, the game definitely does the gold highlighting; I'm guessing at the trigger, based on my personal experience. edit: p.s. Oh, also, it should be noted that each stargate glyph lights-up only when the level has been unlocked by completing the immediately prior level. Last edited by ploog on August 14th, 2017, 7:37 pm, edited 1 time in total. Nice, but I wouldn't think it necessary given the other sub-forums (BT,TTON,W3, General) have custom header graphics. Maybe just post your header graphic to give the site admin a head start...? Wow! You have found almost all of the secrets! Would you consider writing some kind of guide/FAQ for us less-gifted players? I am managing to complete the main storyline (so far), but ever since stumbling upon the trow in a bottle I have been quite desperate for more secrets. Just 4 caged critters to find, I believe, in addition to gaining access to one locked behind an impenetrable door, and possibly a spell flask or two. I'm trying to resist watching videos to find my missing secrets, but may have to surrender at some point; I've passed the point of diminishing returns, especially in light of limited VR time. I'd be happy to contribute to a guide/debrief on the game, but I'd be more comfortable doing so if the forum's spoiler tags worked. Another obstacle to documenting my findings is that I don't have a photographic memory and so would need to go through the game again to do any research -- and I only have access to the VR system occasionally, since it's my nephew's setup (to which I contributed the Oculus Rift) and so VR time for me is a scarce commodity. My recommendations would be to always use the "seeing orbs" when they're available to look for hints at hidden rooms, and use your wind spell to blast walls that look less substantial -- especially when a pick-axe is found nearby. p.s. I only figured-out how to properly handle the Trow in a Bottle on my follow-up pass. Conclusion: Yep... spoiler tag still doesn't work. This YouTuber (JJGuardian) is publishing a detailed video for each map level, including spoilers/reveals for nearly every secret in the game.